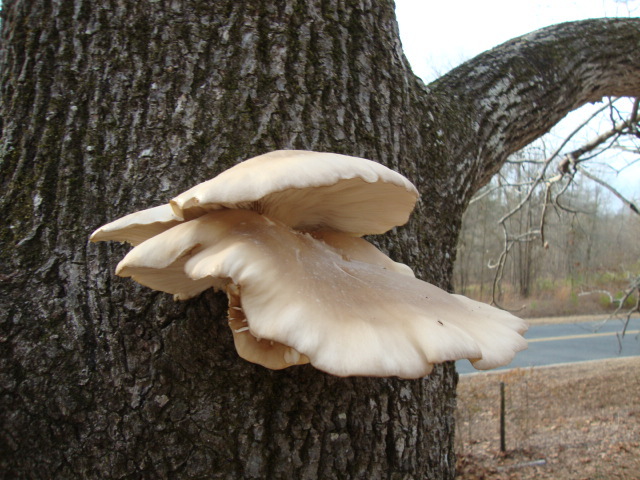 Has anyone grown oyster mushrooms on logs? I'm going to try to raise oyster mushrooms on a log or two. Has anyone done this before? Please share your experience. Thanks. Sorry but the only experiences I can share with you are from finding oyster mushrooms growing naturally. My parents woods has tons of spring oyster mushrooms when the conditions are right. I have also come to find that some of the bagged mulch I bought for the landscaping around my house must have a bunch of fall oyster mushroom spores. Here's a pic of one of the harvests from the mulch at the house. My wife and I were eating these for a week straight. We had about 3 harvests like this (all in the same spot) last fall. Delicious! I haven't but was going to try chitocki (sp) mushrooms on longs. If you try it let us know how well it works and if I actually go thru with it I'll let you know! Those mushrooms do look yummy! Here's a link on how to grow Shitake mushrooms. I'm going to try the technique with the oyster mushrooms. I'll let you know how it turns out. How do you know which mushrooms are edible? To make sure mine would be edible, I ordered Pearl Oyster Plug Spawn--Approx. 100 Plugs from Fungi.com They should arrive early next week. This is just an update on my new hobby. I got the oyster plug spawns early this week and decided to inoculate 4 logs. Since the logs were small, I had some left-over plugs so I went ahead and put them in a plastic bag full of pasteurized hay. The plugs in the bag are definitely growing while the ones in the logs haven't shown much growth. Of course it's hard to see when they are sealed over with beeswax. Added a couple more pictures to the link above to show the progress of the shrooms this evening. I'll try to post pictures just once a week instead of every other day from now on. I'm experimenting with shitake plugs in oak logs. Mine were prepared last summer, so we are patiently waiting. The logs are blocked up off the ground a few inches, are set in the semi shade of an oak tree, and are at the end of the sprinkler range that is on a timer during warm weather. Will post an update when and if we get a bloom. As I understand it, it may take up to 1-2 years for mushrooms to start developing. As a related note, we have a half dead walnut tree in the yard, and what appear to be oyster mushroom started growing this winter, which has been very mild. I'm scared to harvest any wild mushroom however, as have no real training in such. Imafan and Hendi - G found some beautiful Lion's Mane in the woods where he hunts. I was 99% positive that it was Lion's Mane but before eating it I sent pics to the university botony department for a positive ID. I have been avoiding this thread because I have been wanting to do this but have not been able to. FWIW -- I did a pretty thorough experiment with growing them indoors a couple years back. Here's the thread if you are interested. Please keep us updated -- if it become less daunting after following your experiences, I may try to do this. Thanks for the info, Applestar. I did find your link last night and read through most of it. Why did you stop growing them? Weren't you able to harvest mushrooms? In case anybody is interested in experimenting with me, here is the procedure I am trying. 1. Prepare the work area by cleaning surfaces, containers and utensils. Materials needed: clean plastic bag, wheat or grass hay, big pot of water (I used my pressure cooker), thermometer, gloves, mushroom spawns (I actually used the extra plug spawns that were intended for inoculating logs). Sawdust spawns could probably be used also. How: Pasteurization is heating wet material to 55Ã‚Âº to 60Ã‚ÂºC (131Ã‚Âº to 140Ã‚ÂºF) for 30 minutes. No part may be at less than 55Ã‚ÂºC (131Ã‚ÂºF) or more than 60Ã‚Âº (140Ã‚ÂºF). Why: The purpose of pasteurization is not to get rid of all organisms, but to get rid of those that compete with the mushrooms and to INCREASE the organisms that discourage diseases, consume hemicellulose, provide nitrogen, and become food for the mushrooms. Procedure: On the stove top, boil a big pot with 2/3 full of water close to 140 degrees F. If it gets too hot, I just add some cold water or ice to bring the temp down to around 140. Turn the heat down enough to maintain the water temp between 131 to 140Ã‚ÂºF. Add the hay and place a smaller pot over the hay to keep it submerged in the water. Place the thermometer into the hay to monitor water temp. Leave the hay in the hot water for a minimum of 30 min but no more than 60 min. Then drain the water from the pot and let it cool to around 70Ã‚ÂºF. 3. Place substrate and spawns in bags. I copied part of the method shown in the link below. MObeekÃ¢â‚¬â„¢s procedure: Place a roll of hay in the bottom of the bag, place several plugs on top of the hay on the outside edge. Add more layers of hay and plugs till you fill the bag. Compact the straw as much as possible, leaving no air pockets within. Leave enough room at the top to loosely seal the bag with ties or duct tape. Cover the hole created by the loose seal with a clean cotton ball to prevent bugs from crawling in. Wipe a pin and the outside surface of the bag with alcohol or hydrogen peroxide (where you want to poke pin-size holes on). Poke several holes (maybe 6 to 12 holes) into the side of the bag. Place the bag in a dark warm room (spare bedroom) until mycelia has completely covered the substrate within Ã¢â‚¬â€œ 10 to 25 days. At this stage, cut small horizontal holes (about 1 inch) on the bag (with sterilized razor blade) where you want mushroom flowers to grow through. Move the bag in another place that has good aeration and soft light (i.e., kitchen). Spray with filtered water 2x/day (morning and evening) until mushrooms have emerged and are ready to be harvested. For the bag = the mycelia is slowly spreading inside the bag. I could smell the anise-like aroma whenever I pass close by that bag. For the four logs = I decided to bring them to the main floor instead of leaving it in the basement to keep any mice lurking around down there from eating the beeswax or any mushroom that tries to fruit out. When I took a picture of the logs, I noticed green patches on 2 of the logs' barks. So I emailed Fungi.com for advice and Mr. Gouin suggested I spray them with 10 parts of water mixed with 1 part of H2O2 (peroxide) for about 2-3 applications. I hope it works. MObeek wrote: Thanks for the info, Applestar. I did find your link last night and read through most of it. Why did you stop growing them? Weren't you able to harvest mushrooms? I harvested plenty for my family to eat. It was a lot of fun too while they were growing well. The fun stopped when there was a huge outbreak of fungus gnats. At first I was able to control them but I wanted to stay organic and when they exploded after temps warmed up and it became impossible to keep up ... And I realized I was spending unacceptable amount of time on the effort and that I was not having fun anymore, I decided to throw in the towel. It was also time to start spring seeds and I needed the space. Has anyone ever grown mushrooms in their basement?? raised beds... can I use logs?